ISO 6346 is an international standard covering the coding, identification and marking of intermodal (shipping) containers used within containerized intermodal freight transport. The standard establishes a visual identification system for every container that includes a unique serial number (with check digit), the owner, a country code, a size, type and equipment category as well as any operational marks. The standard is managed by the International Container Bureau (BIC). The illustrated example is a code for a container owned by Hapag-Lloyd AG. Presently, all official BIC container codes end in “U”. However, the Association of American Railroads recognizes similar codes for their containers and trailers traveling by rail in North America, however these are not recognized by the BIC and lack check digits. Under the ISO code, then, only U, J, and Z are in use. The refrigerated (reefer) container is identified by means of the size type code. 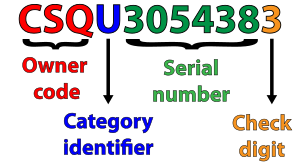 The serial number consists of 6 numeric digits, assigned by the owner or operator, uniquely identifying the container within that owner/operator's fleet. The check digit consists of one numeric digit providing a means of validating the recording and transmission accuracies of the owner code and serial number. The individual digits of the serial number keep their numeric value. Each of the numbers calculated in step 1 is multiplied by 2position, where position is the exponent to base 2. Position starts at 0, from left to right. Subtract result of (iv) from result of (i): This is the check digit. If the final difference is 10, then the check digit becomes 0. To ensure that this does not happen, the standard recommends that serial numbers should not be used which produce a final difference of 10; however, there are containers in the market which do not follow this recommendation, so handling this case has to be included if a check digit calculator is programmed. Notice that step (ii) to (v) is a calculation of the remainder found after division of (i) by 11. Most programming languages have a modulo operator for this. Attention should be paid on how it is working in the language chosen; i. e. if it is giving back the decimal rest or the integer rest in order to get proper results. 11 is used as divisor because a container number has 11 letters and digits in total. In step 1 the numbers 11, 22 and 33 are left out as they are multiples of the divisor. In day-to-day business it happens that containers do appear which do not follow the ISO 6346 identification at all; however, they are fully CSC safety approved containers. Usually these are "shippers owned" containers, which means that they are not owned by the carrier but supplied by the cargo owners (shippers). They may have no registered owner code and no category identifier and have no check digit. It is advisable to follow ISO 6346 as the absence of a compliant identification code causes problems for both carriers and container terminals to correctly identify the equipment and properly deliver the cargo, because computer systems require ISO 6346 conformant naming and as such missing prefixes are invented. For example, YYYY at the carrier and XXXX at the terminal causes the equipment to mismatch. Moreover, since ISO 6346 identification has become a requirement in international Customs conventions (Customs Conventions on Containers and Istanbul Convention), many Customs Administrations have begun validating that containers are marked as per the standard. 20GP GENERAL PURPOSE CONT. 20G0 GENERAL PURPOSE CONT. 22GP GENERAL PURPOSE CONT. 22G0 GENERAL PURPOSE CONT. 42GP GENERAL PURPOSE CONT. 42G0 GENERAL PURPOSE CONT. 45GP HIGH CUBE CONT. 45G0 HIGH CUBE CONT. 45UP HIGH CUBE HARDTOP CONT. 45U6 HIGH CUBE HARDTOP CONT. L0GP HIGH CUBE CONT. L0G1 HIGH CUBE CONT. L2GP HIGH CUBE CONT. L2G1 HIGH CUBE CONT. L5GP HIGH CUBE CONT. L5G1 HIGH CUBE CONT. The country code consists of two capital letters of the Latin alphabet as described in ISO 3166. It indicates the country where the code is registered not the nationality of the owner or operator of the container. The letters of the code shall not be less than 100 mm high. ^ "ISO 6346:1995 - Freight containers -- Coding, identification and marking". www.iso.org.